Click Here to download a pdf version of this 2018 Tax Reform Guide! For most taxpayers, the sweeping changes to federal tax laws enacted by Congress at the end of 2017 will be most apparent when it comes time to report 2018 income. But smart taxpayers will make an effort to understand these changes in advance, since many of the decisions we make are based upon past tax consequences that no longer apply. Now that we can no longer rely on a lot of those assumptions, it’s a good time to dive in for a closer look at the new tax laws and think about the wisest course to plan for your financial journeys in 2018 and beyond. You’ll also pick up some strategic tax planning tips that can reduce future taxes. This guide is intended to give an overview of the new tax reform law, organized to highlight those changes likely to have the most significant impacts on the individual and business activities of our clients. It would be impossible (not to mention tedious) to give a comprehensive accounting of all the changes large and small – the final language in the reconciled conference report was 1,097 pages. It will take several years, if not a decade, before regulations are firmed up as tax court rulings provide interpretive guidance to all the changes to the tax code. However, some things we do know for sure. Many of the rates and formulas have changed to a significant degree so that old assumptions are now playing into a whole new ballgame, creating multiple traps for the unwary. Here is an overview of the most important changes to the tax code that you’ll need to understand right now. One of the goals of tax reform was simplification for the individual taxpayer based on this proposition: increase standard deductions to reduce the number of taxpayers itemizing deductions. High income earners with qualifying deductions may still find it advantageous to itemize, even though limits have been placed on many of the items they’ve fully deducted in the past. State and local taxes limitation: The state and local income tax deduction will be limited to $10,000 annually for most filing statuses. (Married Filing Separately is $5,000 each.) This will hurt anyone living in areas with high state and local tax rates, and higher income earners ($200,000+) no matter where they live. Mortgage interest: Mortgages closed after 12/15/17 (or 4/1/18 if a written contract existed prior to 12/15/17) will have mortgage interest limited on mortgages greater than $750,000. Existing mortgages will be treated as they were, with a $1,000,000 threshold for interest limits. Debt that is refinanced for loans exisiting prior to 12/15/17 is grandfathered in, with some qualifications. Home equity loan interest: Starting with 2018 income tax returns, interest on home equity lines of credit is no longer deductible. If you had planned on using funds from a HELOC for seeding other types of investments, you will need to factor in that higher debt cost. Second mortgages used for substantial home improvements still qualify for the mortgage interest deduction. 2% limitation: The 2% of Adjusted Gross Income (AGI) limitation on miscellaneous itemized deductions (tax prep fees, investment management fees, unreimbursed work expenses) has been eliminated. Casualty and theft losses: This deduction has been eliminated, unless the loss takes place in a federally declared disaster area or if the loss is used to offset a casualty gain. This is a good time to check your casualty insurance policies to make sure all your real and personal property is adequately covered, since you can no longer use such losses to reduce taxes. Moving expenses: Moving expenses are no longer tax deductible, unless the taxpayer is in the armed forces and the move is due to a permanent station change. Charitable donations: These are still deductible, but you will only receive the tax benefit if you itemize. If you can itemize then it makes sense to itemize and claim your charitable contributions. Athletic Ticket Donations: The 80% deduction that could be taken for charitable contributions which provide seating priority benefits is no longer available. The combined effect of all the above means that fewer people will itemize their deductions. To that extent, one major tax simplification goal will have been achieved. 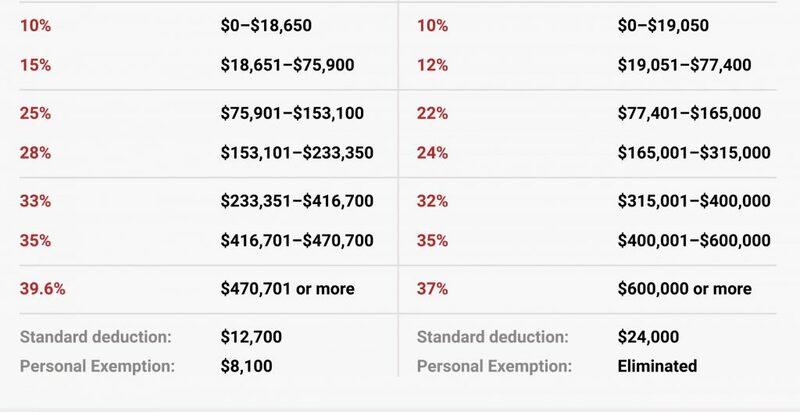 Whereas before you could deduct personal exemptions of $4,050 for yourself and everyone in your household (subject to phaseouts), these personal exemptions are now eliminated. This elimination is intended to be offset by the increase in standard deduction. Eliminating personal exemptions will have the most significant impact on families with more children, especially those with dependent children over the age of 17 (such as college students). Child Tax Credit: The child tax credit (previously $1,000 per child per child under age 17) has been increased to $2,000 per qualifying child. They’ve also increased the phase-out levels to $400,000 for Married Filing Jointly (MFJ) and $200,000 for Single filers.The refundable portion of the child tax credit (where you might receive back more in a refund than you paid in taxes) is limited to $1,400 per child. A $500 credit is allowed for any dependent who is not a qualifying child. 529 Savings Plans: They’re not just for college any more. Starting in 2018, $10,000 per student can be used for elementary through high school tuition. College use of a plan does not face the $10,000 annual limit. Child Tax Rates: The “Kiddie Tax” – where a dependent child’s investment income was taxed at the typically higher rates of their parent – has been modified. Alternative Minimum Tax: The dreaded Alternative Minimum Tax (AMT) has higher exemption amounts and while it still exists, it is expected to impact fewer individuals. Gift taxes: The gift tax exclusion has been increased to $15,000, from $14,000. Estate Taxes: The Estate Tax exemption has increased to $11,200,000 for individuals, and $22,400,000 for married couples. Due to the last two changes described, high net worth individuals may want to consider revisiting their estate and gifting strategy. If you’re getting divorced, alimony related payments won’t be counted any more. Beginning with divorce settlements and agreements enacted in 2019 and later, payments related to alimony agreements are no longer deductible for the payer, and will not be considered income to the recipient. Anything in place before 2019 will be grandfathered in (meaning still deductible on one side and taxable income on the other side). You’ll no longer pay a penalty if you don’t purchase individual health insurance; the Affordable Care Act “Individual Mandate” goes away. The shared responsibility payment owed if a taxpayer doesn’t enroll in a health insurance plan is repealed, starting in 2019. Some of the changes are temporary. Most of the individual tax rate changes are scheduled to revert back to the old code after 2025. C Corporation income is now taxed at a flat 21%. This includes many types of small businesses and personal service corporations such as medical, legal and accounting practices, which were previously taxed at a flat 35%. Dividends paid from a C Corporation will still be taxed at the individual level, but the decreased C Corporation rate makes them more attractive. 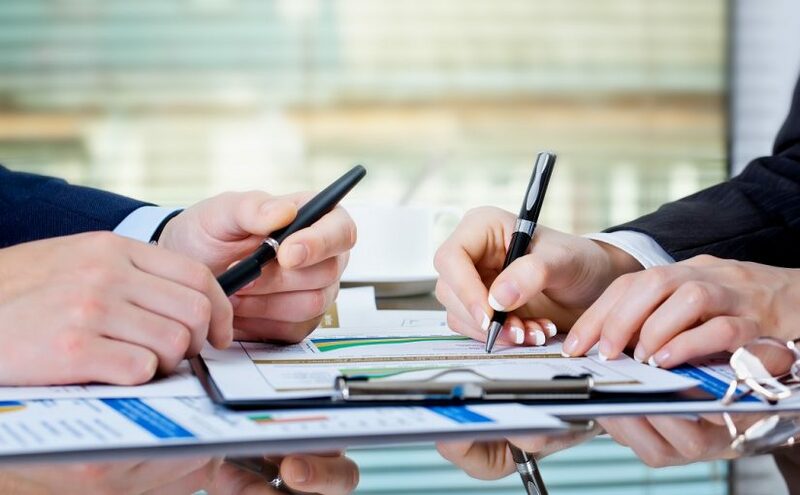 Some C corporations meeting certain conditions qualify their shareholders for a capital gain exclusion on sale of corporate stock, increasing their advantages even further. C Corporations are excluded from the new rules on Qualified Business Income, discussed below. 2. A Big New Tax Cut on Pass-Through Business income. Pass-through income from sole proprietorships, S corporations or entities such as LLCs that are a qualified trade or business can receive up to a 20% deduction of their income that is generated from the qualified trade or business. Income from real estate assets would typically fall under QBI tax treatment. The end result of the QBI deduction is a lower income tax rate on the pass-through business income. One of the wrinkles is that S Corporation shareholder wages do not count as qualifying business income (i.e. they do not receive a 20% deduction). Do not interpret this to mean that S corporations are going to necessarily be less advantageous than other pass-through options. The IRS still requires S Corporation shareholders to take a reasonable salary. The QBI deduction is very complicated and convoluted, despite Congress’ stated goals of simplification. One of the points of confusion is how different types of businesses are treated differently for the QBI deduction phaseout. If personal taxable income is greater than $315,000 for MFJ, or $157,500 for other statuses, then the 20% QBI deduction can be limited. 2) The sum of 25% of W-2 wages plus 2.5% of the unadjusted basis of all qualified business property that hasn’t been fully depreciated. For these types of businesses, the 20% QBI deduction is phased out between $315,001-$415,000 for Married Filing Jointly, or $157,501 to $207,500 for individuals and heads of household. It’s not subject to the the QBI deduction limitations previously referenced; it is simply phased out, and the benefit is lost. This phaseout can result in a mind-boggling, almost 70% effective marginal tax on income earned above the phase-out range as the deduction is lost on income that was previously eligible. Computers are no longer considered listed property, which will make them easier to depreciate more quickly. The annual 179 depreciation limit was increased to $1,000,000 (up from $510,000). The phaseout threshold was increased to $2,500,000. 100% bonus depreciation is allowed on both used and new property. All of this means it will be easier to expense business equipment in the first year. As of 2018, both C corporations and flow-through entities (partnerships and S corps) can use the cash method of accounting for tax purposes if average 3 year gross receipts are less than $25,000,000. The UNICAP rules for inventory calculations now only apply where the three-year gross receipt average is greater than $25,000,000. Limited to 30% of Earnings Before Interest, Taxes, Depreciation and Amortization (EBITDA) for businesses that have averaged greater than $25,000,000 in revenue over the last 3 years. Motor vehicle dealers using loans for floor plans are not subject to this limitation. Can no longer be carried back- they can still be carried forward, but carry-forward can only offset 80% of taxable income. Now allowed only for real estate. Eliminated for 2018, except for C corporations which have until 2019. Knowledge is Empowering, While Smart Planning Wins the Day. Even in normal times, learning how to minimize your tax liability is both an art and a science. In this year’s rapidly changing tax environment, it’s essential that you work with a CPA firm whose professionals understand both you and how the tax laws and regulations are changing, and may continue to change. It’s reckless to assume from the headlines that you will be better off under the new tax laws; there are still too many moving parts. Don’t assume that any previous tax structuring you’ve done is still optimal. Whatever you do, don’t wait until 2019 to discover that you could have done something today to lower your taxes significantly for all of 2018. We look forward to helping you assess your situation, weigh your options, and to help with making any structural changes that can minimize your annual tax bills going forward. At Adam Shay CPA, PLLC, we have set an audacious goal for 2018: We are striving to save our clients a combined $1 MILLION on their 2018 income taxes! It’s a tough challenge, but we’re ready. We’ll be looking under every rock and crevice of the new tax code to find every possible savings for every single one of our clients that engages us for this purpose, in order to meet our cumulative million dollar goal and to help our clients maximize their post tax cash flow. 1.Book an appointment this spring for a Tax Reform assessment. 2. Call (910) 256-3456 or email [email protected] to inquire about our full suite of business and personal income tax services. 3. Attend one of our tax reform webinars. 4. Share this guide with a friend who needs help navigating the new tax reform provisions. To stay connected and updated join our email newsletter.